Over the past 20 years there’s been no shortage of films that have reminded us of the imminent dangers of climate change. From clunky efforts like Waterworld and The Day After Tomorrow to the more recent metaphor-laden Snowpiercer, filmmakers have undoubtedly played their part in keeping the issue high on the global agenda. The problem with doing this in narrative cinema is that audiences will be acutely aware that they are listening, watching, and expected to learn from, the actions of characters in a movie – diminishing any educational potential that the material may have possessed. This, however, is where a documentary like Ice and the Sky steps in. It sees French director Luc Jacquet, Oscar-winner for his 2005 documentary March of the Penguins, return to similarly icy climes, as he focuses his lens on the life and works of respected glaciologist Claude Lorius. It’s not a documentary that in any way tries to give a balanced, both-sides-of the-coin viewpoint, and it’s all the better for it. By presenting an engaging, fact-driven account of Lorius and his theories, the documentary serves as a concise, alarming and all-too urgent summary of the state of our planet from a scientific standpoint. Even though at times Lorius’s rather dramatic voiceover can tend towards pretension, the film’s message is always heard clearly above the exhaustingly beautiful cinematography, with shots that skim over the stunning, snow-capped environs. If there’s a lesson to be learned from Ice and the Sky – beyond the obvious perils of ignoring the signs of climate change – it’s of the importance of the research, drilling and testing that are behind the conclusions on offer. It’s to the film’s ultimate credit that these processes are recognised and reconstructed, so that we are able to marvel at a life spent convincing the world of what it was unable to witness for itself. Now, more than any other, is the time to see such things. 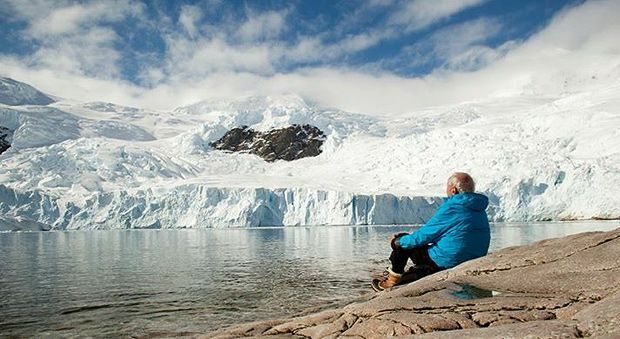 Selected release from Fri 11 Dec.
Director Jacquet (March of the Penguins) returns to icy climes for this documentary about glaciologist Claude Lorius and the painstaking research he has done about climate change. Beautiful cinematography in the service of a concise, alarming and all-too-urgent summary of the state of our environment.